Bates College will celebrate Native American Heritage Month with a series of events sponsored by the Multicultural Center, beginning with a talk by photographer Kenji Kawano, author of the book “Warriors: Navajo Code Talkers” (Northland Publishing Company, 1990), at 7 p.m. Thursday, Nov. 1, in Chase Hall Lounge. A reception featuring foods from five Native American nations will follow, and the public is invited to attend free of charge. Kawano’s work, on display at Bates through Nov. 15 in Chase Hall Lounge, chronicles the contribution of Navajo Marines who provided the language used for communicating classified messages and troop movements for the U.S. Pacific campaign during World War II. The Japanese were unable to break the code. Kawano, who left his native Japan for the United States in 1973, first learned about the code in 1974 while hitchhiking on the Navajo’s Arizona reservation. The driver who picked him up had been a code talker during World War II. 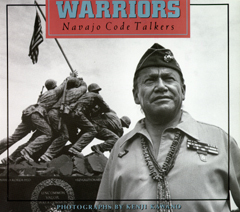 Eventually, Kawano became the code talkers’ official photographer and an honorary member of their association. Other Bates events honoring Native American heritage include a lecture by the Honorable Robert Yazzie, chief justice of the Navajo Nation, who will discuss The Unique Status of Tribal Courts in the Context of the U.S. Judicial System, at 7 p.m. Wednesday, Nov. 7, in the Benjamin Mays Center; and a talk by Andrea Smith, a member of the Cherokee Nation and a founder of Women of All Red Nations (WARN) and INCITE: Women of Color Against Violence, who will discuss Sexual Violence and American Indian Genocide at 4:30 p.m. Thursday, Nov. 29, in the Mays Center. The concert scheduled for Friday, Nov. 30, by the Native American rap group WithOutRezervation(WOR) has been canceled. The Yazzie and Smith events are also open to the public at no charge. For more information, call the Bates College Multicultural Center at 207-786-8215.